Victorian Pine Bank of 28 Grocer's Shop Drawers...straight from the shop in Wales. Absolutely original including a full set of brass knobs. I have left it just as I found it and there is some paint on the right hand side edge which could be sanded off...the top and other side are unwaxed but would wax. Lovely hand painted labels on some drawers as shown in the photographs. 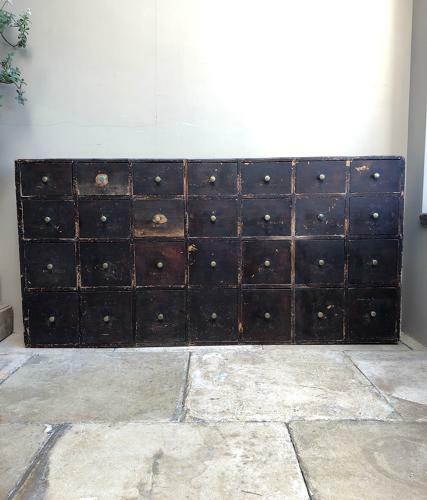 The top, sides and drawers are all in good antique condition with no worm. The backing boards have had worm at some point but historic and been dead for many years. This is a large piece and would need to be collected or sent by Courier UK £55 (Not including Scotland).